Keep reading to learn how to get to Yangshuo, when to visit it, and what to do in town! Guilin, which is fascinating without a doubt, is the gateway where the Li River descends, but I recommend that you head directly for Yangshuo from the airport in Guilin. Once you’ve landed there are various options for getting to Yangshuo. By taxi the price can vary between 290 and 490 Yuan and if you’re a group of 3 or 4 it could be worth it. Since 2013 there is a Shuttle Bus service from the airport to the north station of Yangshuo. A ticket costs 50 Yuan, and can be purchased right at the airport near the bus stop. 09:30 – 11:30 – 13:30 – 15:30 – 17:00 – 18:30 – 20:00 – 22:30. If you’d like to save money, instead of arriving in Guilin by air you can do so by train. Note however that. depending on your departure city, it might take 24 hours or more to get there. Click here to read our guide on trains in China. For more information on how to get to and from Yangshuo, I recommend the web page Yangshuo Insider. 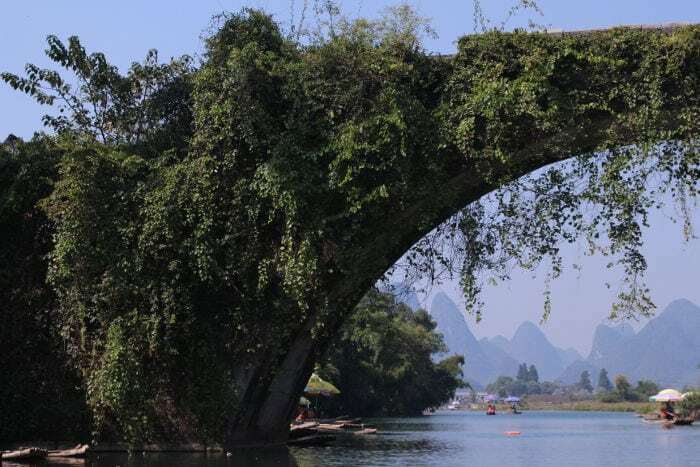 The best time to visit Yangshuo is between the end of March through all of May and between the end of September through all of November, when the weather is relatively mild, the days are generally sunny with temperatures ranging from 20 to 30°C. Alternatively you could also go between November and December, when visitors are few and you can enjoy the karst hills in peace. Avoid like the plague the Chinese national holidays between May 1-3 (The Workers Holiday), between October 1 and 7 (National Holiday) and the Spring Festival (January-February, the exact dates vary from year to year): prices double and there are so many Chinese that not only will it be difficult to walk the city streets, but finding a train or air ticket or hotel will be an undertaking. As far as hotels go, I send you to our guide on the best hotels of Yangshuo. You’ll just have the hassle of choosing! One of the best ways to fully enjoy these unique hills is to “visit” them by boat. 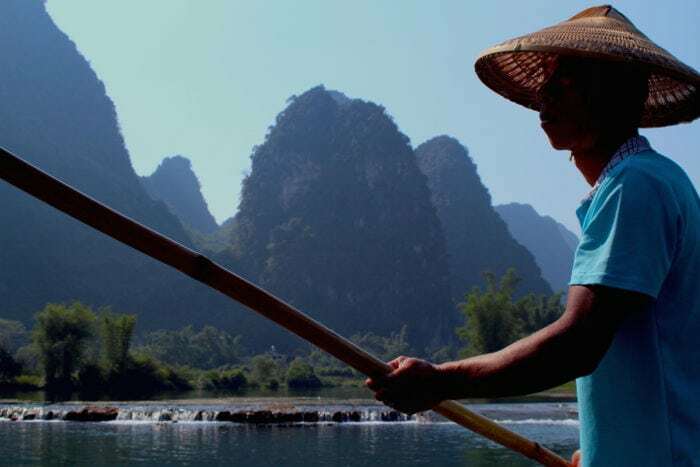 Forget about the Li River tours that leave from Guilin and arrive in Yangshuo. This is the most inflated option. 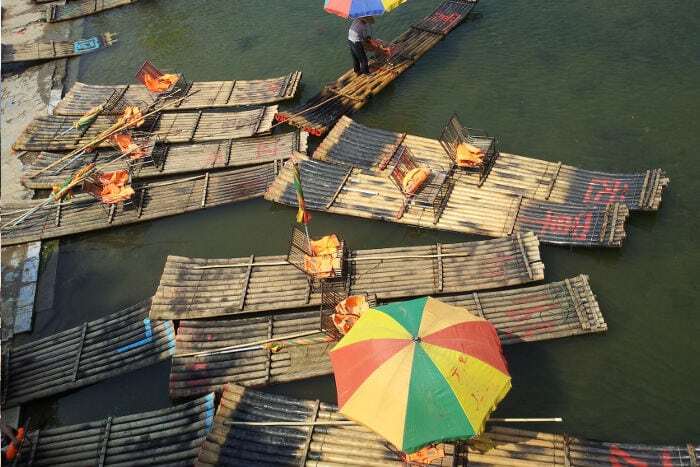 It has an average cost of 420 Yuan a person and lasts up to 6 hours, where you won’t enjoy the sounds of nature bit will be surrounded by the fracas of numerous motor boats that sail the rivers overflowing with tourists. Once in Yangshuo, all you have to do is go to one of the many tour agencies you’ll find throughout the city. 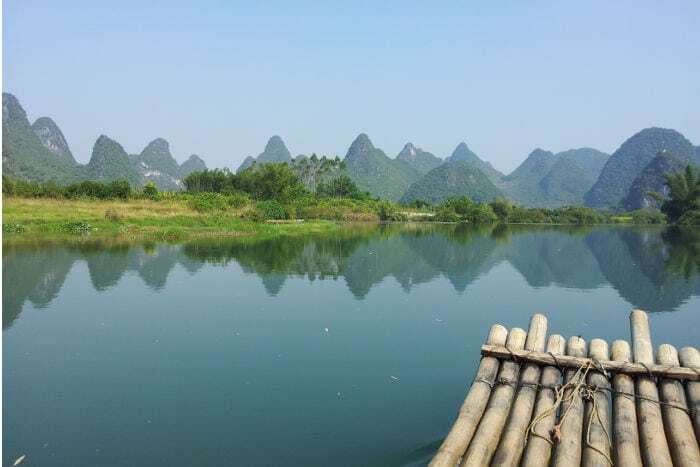 For an average of 200 Yuan you can get a tour on a bamboo raft for two on the Yulong River. 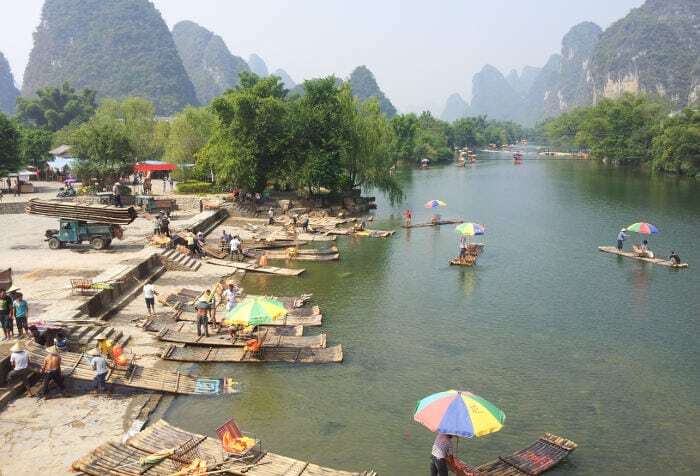 Attention, this is not the Li River, rather one of its tributaries that offer the same panoramas, without however the noisy caravans of tourists and, above all, on original bamboo rafts used for fishing with cormorants. The same offers you’ll find in the tour agencies you can find (cheaper at times) offered in your hotel or hostel. To get to the Jinlong Pier marina, where the rafts are docked, just go to the north bus station and take the bus that stops at Jinbao Town. Or if you’re lazy, take a taxi. And for the return? Bikes! Ah yes, because where you dock there are barely any taxis but a bike rental service to get you back to town in 40 minutes. We rented a tandem for 30 Yuan. You’ll have to leave a deposit of 100 Yuan which will be refunded at the rental office in Yangshuo. My recommendation: make them write the address of where you need to leave the bike or take a picture of the displayed map! The distance you’ll need to cover to get to Yangshuo is a few kilometers, and bicycles are the second best way to enjoy the karst nature (after rafts). Absolutely recommended! If you don’t have plans to go as far as Jinbao Town to take a raft, you can also rent a bike in Yangshuo (in your hotel or in one of the many places where they rent bicycles) and lose yourself for a few hours in the surrounding hills. The Yangshuo cormorant fishing is without a doubt one of the most peculiar activities that you can see in this region of China. 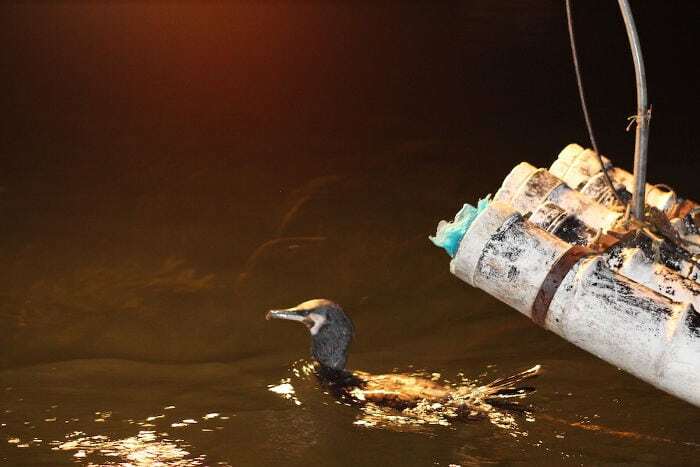 This type of traditional fishing is based on the “work” of the cormorant, a bird that is capable of catching fish underwater. The fisherman (who trains these animals for a good 8 years before they can fish) places a string around the bird’s neck so that it can’t ingest the fish, which remain blocked in their throats. The birds, with the help of a lantern on the bow, dive underwater where they locate the fish and catch them in their beak. Afterwards the fisherman “empties” the animal’s throat to gather the catch. We booked a fishing with cormorant tour for only 50 Yuan near our hostel, where toward evening a guide came to get us to bring us by foot (about 5 minutes) to the banks of the River Li, which is still in Yangshuo. On the shore we got into a boat with other people and came alongside a fisherman on a bamboo raft (this time by motor), surrounded by his faithful cormorants. The spectacle we saw is marvelous. The fisherman goes ahead into the darkness of the river with only the dim light of the lantern, while the animals, the only form of livelihood for centuries, carry out their work better than any human fisherman. It might seem that such a practice may be cruel for the cormorants. To us though it seemed that the birds were treated well and that there was a good rapport between man and animal. Moreover it’s a type of fishing that is neither invasive or destructive to the environment. Finished with the fishing, we stopped at the edge of the river where the fisherman showed us how to gather the fish from the animal’s house and later, give them something to eat. At this point it is possible to take lots of pictures together with the cormorants. Careful not to touch them though, their beak is enormous and almost lost a finger while trying to pet one. If you pass through Yangshuo don’t hesistate to try this incredible experience! Marco De Stefano is a fan of politcs, rock and forays around the world. Don’t ask him anything about pirates, unless you want to listen to dozens of true stories about the most incredible travelers in history. He sees his travel blog as a tool to support travelers that helps furnish practical and up to date information. If you have decent ability with English here is his blog: Daytripandmap.com. You can also contact him on Youtube.